The last word on Social Justice Warriors, the Anti-SJW movement, Nazis, and Comics! Everything is political. Because we all have a point of view. And when things conform, or do not question our point of view, we tend to think of them as non-political. But everything is an expression of our values, from Mickey Mouse to Batman to Star Wars to Popeye. Everything has a moral perspective, a concept of what is heroic, and what is villainous, based on where we were raised, and how we were raised, and sometimes.. if we are lucky, based on how we have grown. You have a vocal faction these days, a minority, that wants to play the aggrieved party and the victim and label and attack others that they perceive as a challenge to their norms, they attack creators and they attack fans, and brand them with the label SJW. This vocal faction using acronyms over the whole or correct word, the way traditionally oppressive, bigoted factions have done. SJW instead of Social Justice Warrior, PC instead of Respect, etc. It is the tactic of the Nazi, to use labels and intimidation to cloud reason. To call others what they are, closed minded, and intolerant. And on this web of lies and misdirection, hope to confuse the issue, and gain ground. The issue is simple. Social Justice Warriors, as it relates to comics, is in the very origins of the super-hero. The fight for the under privileged against monied interests, and oppressive regimes. It is right there in the earliest issues of Superman, of Batman, of Captain America. There were people back, in a 1940s America, who made death threats, and attacks against creators. People who attacked Jack Kirby and Joe Simon, for having Captain America, on the cover of Captain America #1, punch out Adolph Hitler, for effectively creating a Social Justice Warrior, and a social justice medium. The people railing against Social Justice Warriors and Comics back then in the early 1940s are the same ones railing against writer Ta-Nehisi Coates, and what they call SJW or Social Justice Warriors today, they are Nazis or they are ignorant. Now if you are ignorant, that is not a crime as long as you don’t stay ignorant. We all wake up, if we are honest, everyday ignorant of something. And we all… if we are healthy, growing human beings… go to bed less ignorant than we started the day. We have read, we have talked, we have communed, we have learned,. we have grown, and we have thrown off at least one incorrect folly we held too. This is your chance to grow. If no one has pointed out to you the immorality of a rant against social justice warriors, in the social justice medium of comics… well I’m telling you. Now what you do with that determines, if you are just ignorant, a fool, or a Nazi. A fool and a Nazi are not going to change. An ignorant man however, if he be a man, will embrace opportunities to slough off the hates and misinformation of yesterday. Un-subscribe from those click-bait, hate mongering channels, posing under names completely contrary to what they are doing. Channels with names like We Love, and Diversity, but all they preach is hate. A lot of you are subscribed to them out of habit. Habit to give attention to lowest common denominator talk show type conflict and what passes for conversation. This Resident Trump did not win the popular vote, but he won more of the vote than he should have in a civilized country. Part of the reason is seen in Youtube, and across social media. We have become a nation that has traded talk show drama for dialog, and irrational rage and outrage, over reason. That is a recipe for a falling down nation, a recipe for the end of days. I say no to lies. I say no to misinformation. I say no to collusion. I say no to agents of chaos, seeking to subvert one of the few progressive mediums left…. comics. The majority of these fools do not even read the works or writers they complain about. You don’t like a writer or story, don’t read it. But to attack creators and mess with livelihoods because you don’t want anyone else to read the story… that is Nazism. And I won’t have it. Too many of those who paved the way for you even being here, sacrificed way too much, to let the hate they beat back… rise in the very hearts of their indolent children. I say it in what I subscribe to. I say it in what I buy. I say it in who I defend. And I say it in the face of a new American age of terror and witch-hunts. COMIC TOM 101- Closest the Youtube comic community comes to really great investigative reporting. Excellent channel. WE LOVE COMICS- This channel has some very informative videos, and is very big to call out other channels on what they are or aren’t doing, but his recent blinders on defense of grading company PGX and spinning that conversation away from the latest PGX issue, the claim they were pressuring graders to grade books high, so they could sell such books through a shill account, is completely ignored and instead he attacks the claimant, going so far as to hint at said claimant being let go for drug reasons. An inference that both PGX and WE LOVE COMICS backed away from when questioned on it by COMIC TOM101. WE LOVE COMICS, as a YouTube channel, is quick to give lip service to integrity, but I find the whole relationship and shilling for PGX (given, story after story of alarming business practices by this company… ie the WALKING DEAD comic certifying fiasco), paints WE LOVE COMICS in a very disingenuous and untrustworthy light. I would love this channel to step up and be as impartial as it claims to be in regards to PGX, but the host’s failure to ask the obvious question, when he goes on about how he speaks directly to the president of PGX, speaks volumes. What else is on my worst list? Any comic channel that has an issue with Social Justice Warriors – the history of comics from Superman to Captain America is about Social Justice Warrior characters. These characters in their origins are demonstrably Social Justice Warriors writ large, those who are there to protect the populace against the predatory and venal. So if you don’t like Social Justice Warriors maybe superhero comics is not the medium for you. If the channel uses the acronym SJW, and are too lazy to write out the word Social Justice Warrior, it is because they want to make the short hand a meaningless curse, rather than a valid concrete idea. It is like the people who use PC as basically a curse word, realizing that if you replace ‘political correctness’ with its synonym ‘respect’, you would understand better what such people are are really arguing against. So yeah guys, lets remove the attention and the subscriptions from the clickbait crowd and give the attention and numbers to some of the great channels I list above. 20 Best Youtube COMIC BOOK Channels! Week ending 2 June 2018! While relatively new to the Youtube Comic Book watching scene, I’ve been a collector for a very long time. I’m listening and watching these Youtube videos/channels on Comic Books, and these channels are fantastic! It is just great to see collectors of various ages and backgrounds sharing their passion and finds and tips, on a hobby I also get a lot of enjoyment out of it. JERNO’S COMICS & POP CULTURE – Recent find. Very informative. I like his recent project, cashing out his Starbuck’s stock (Long before this most recent news issue, I had no interest in Starbuck’s. Like KFC amd Shell Gas they are on my list of companies to not do business with) and putting it into comic books, and making a greater rate of return on comics than with his Starbuck’s stock. AFTA COMICS – Love listening to this guy. He sounds like the late, great Adam West. May he rest in peace. So yeah, I listen to him tell his stories in his Adam West voice, and I’m entertained, and reminded of the late great Adam West. Really like this channel. Covers great Westerns. CHYCHO – I like his laid back, ASMR (autonomous sensory meridian response, a belief that sound can soothe, and in addition create states in the listener where information is more readily absorbed) delivery. Nice coverage of everything from Golden Age to moderns. And his overview and understanding of economic systems, reinforced some things I knew, and really opened my eyes on some other things. His post PERSONAL FINANCE:CURRENCY,MONEY,ECONOMY,P2:GOLD should really be required viewing, by pretty much everyone. GORE VIDAL- Great coverage of Independents, magazines, and hardcovers, with a love for the Spanish and Italian artists. His multi-episode coverage on Dark Horse’s CREPAX is essential viewing. He stopped broadcasting a bit mysteriously a month ago, anyone with his contact info just let us know he is alright. GABE INFINITY WATCH – I like his coverage of IDW Artist’s Edition. ISLORD372 – New discovery , I really like his collection coverage video. SUPERJOE – Nice selection of various comics from various eras. And some books I had not seen before. COMIC BOOK FANATICS – Shout out to Ray Jr, who left to do a tour in Afghanistan. Stay safe over there,. FOOLKILLER5150 – Appears to be an abandoned channel, but lots of good content still out there. And this installment’s Public Service Announcement – To everyone out there who has an issue with Social Justice Warriors, first learn to use the whole word and not the acronym, second you may want to choose a different medium if you don’t like Social justice Warriors. Because if you are reading Superhero Comics, the first social justice warrior is Superman. Followed quickly by Batman, Shazam, and all the others. The whole of Superhero Comics built on this bedrock of vigilantes, sticking up for the little guy, and taking it to the fat cats, and the corrupt, system. Social Justice Warrior defined. Give love to the channels I mention and be wary of cleaning and pressing a comic. If your comic book is a 4.5, It is a 4.5. The attempt to make it a 5.5 in the short term, can be speeding up the process of making it a 1 in the long term. Ending this on a positive note you 17 channels are always showing me your hauls and recommends, which I greatly thank you for. You’ve put some great books on my radar. Wanted to return the favor. Below is my list of must own comic books, that I think are WAY undervalued and you can still buy incredibly cheaply and will only go up. DAREDEVIL 126 & 127 – One of the best two parters of all time. I read this back in the day and it still stands up as one of my favorite non-Frank Miller DAREDEVIL comics. TORPEDO is a great bronze age character, and this is him at his best. Sporting great Gil kane covers, and a story by Marv Wolfman (who was also Executive Editor at the time, and art by Bob Brown and Klaus Janson. Wonderful visuals. THE UNTAMED – Is a beautiful sword and sorcery graphic novel by Sebastian A. Jones and Peter Bergting and Darrell May. From STRANGER COMICS. A quality and very little known collected edition. DEFENDERS 52- Best Gil Kane Cover. Best done in one story. Best Hulk vs Sub-Mariner fight. One of the Best Keith Giffen and David Kraft co-scripts. From about issue 42 to 52, these guys were on FIRE! Best depiction of the Hulk. Best depiction of Sub-Mariner. Done, done, and done. ADVENTURE COMICS 431-440 -Michael Fleisher’s stories starring the Spectre, with Jim Aparo art have quite frankly never been surpassed. They are for me, the definitive take on the Spectre as a vengeful Wrath of God, with a more than demented sense of perverse punishments. A lurid and legendary series. THE SINISTER HOUSE OF SECRET LOVE #1- Dark Shadows meets the House of Mystery? How do you not love that title and that cover. A must own. I SPY 1-6 – The 60s pushed the envelope in terms of entertainment, writing and scope. Bringing globe trotting adventures into our living room. I SPY along with DANGER MAN/SECRET AGENT MAN and MAN WITH A SUITCASE were some of the best TV shows of the period. 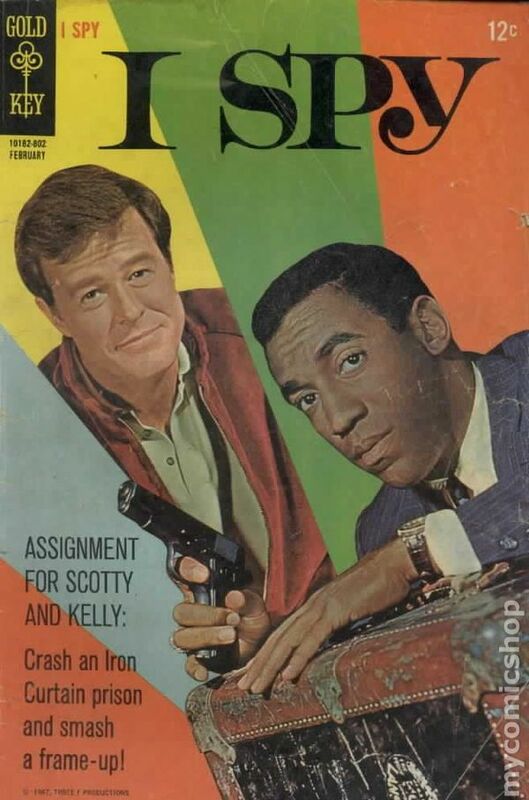 to have that great Cosby and Culp series, also as a comic book is a must own. Great photo-covers. You can get any of the books listed, using the link below. And using the link earns this blog a few pennies to keep the lights on. Hope you enjoyed this post. if you did, spread the word. I’ve been trying out the Amazon Fire lately. It’s interface takes a bit of getting used to if you are used to the Roku, but for the most part is very navigation friendly. It allows the easy install of the three must have paid channels, NETFLIX, AMAZON PRIME, and HULU; however it also offers a selection of excellent free channels. Not as extensive as Roku, but it has a solid selection. For the most part the above channels are easy to load and navigate, offer good content, and keep the ads to a minimum. Three things that the below apps/channels fail to do, and hence end up in our hall of shame. COMICBOOKCAST2 – is basically a podcast with static pics, Not worth the time to download. So there you go, the best and worst channels on Amazon Fire. Feel free to comment with your picks for best and worst!